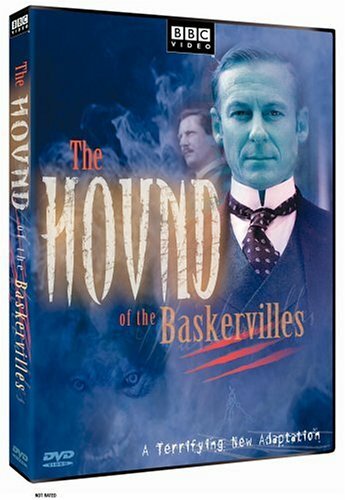 Arthur Conan Doyle’s novel, The Hound of the Baskervilles is probably the most frequently dramatized of all the Sherlock Holmes stories. Most remembered is the 1939 movie with Basil Rathbone as Holmes and Nigel Bruce as a bumbling Watson, but numerous other versions have been made with Peter Cushing, Ian Richardson, Matt Frewer, and even comedian Peter Cook playing the intrepid detective. This time, it’s Richard Roxburgh as Holmes and Ian Hart as Watson in a fascinating take on the story that may outrage some Holmes fans, but serves as an admirably sinister beginning to Halloween week. From its opening scene at the inquest of Sir Charles Baskerville (introduced with a quick shot of Baskerville’s dead, contorted features) it’s plain this is as much a horror film as a mystery. The inquest is held in an austere room grayly lit with daylight filtered through the rain lashing at the windows and marked by witnesses who are plainly less certain than they are willing to admit about the causes of Baskerville’s death. Was it a heart attack as Dr. Mortimer rather hesitantly says at the inquest or, (as he later confesses to Holmes,) the result of a family curse involving an enormous phantom hound? A siren interrupts the proceedings, and the scene shifts to the moor, where an escaped prisoner is being pursued across the foggy, dangerous ground. Before the credits have even stopped rolling, the audience has seen two prison guards sucked horribly to their deaths in a mire. The sense of treachery and mortality that permeates this film has been quickly and effectively established. This is a realistic Victorian England where London streets are pocked with horse dung and country homes are so badly heated that at the breakfast table coffee cups steam and the diners’ breath is visible. But what makes this a truly interesting addition to the roster of Sherlock Holmes dramatizations is that it’s not actually about Sherlock Holmes. The hero here is Dr. Watson who, as played by Ian Hart, bears little resemblance to Nigel Bruce’s plump dimwitted physician. Here, Watson is young, slender, competent, and quite possibly as intelligent if not as gifted as his detective friend, for whom he seems to serve less as a sidekick than as the kind social buffer celebrities often require. Roxburgh’s Holmes is believably brilliant, but often cold to the point of inhumanity, and much of the plot involves Watson’s struggle to ensure that Holmes’ single-minded pursuit of the truth doesn’t lead to tragedy rather than avert it. That Watson is not entirely successful is one of the ways in which this version departs from the Arthur Conan Doyle story. With the exception of the computer generated hound and an enjoyable bow to Doyle’s fondness for spiritualism the emphasis on realism in this production closes some of the logical gaps in the original story. One gets the impression that this is what happened before Watson wrote the account that soft-pedaled his friend’s negligence about the safety of his clients. Richard E. Grant is superb as the villainous Stapleton, and Matt Day is brashly vulnerable as the young heir who Holmes and Watson are charged with protecting. Neve McIntosh is the fragile and luckless Miss Stapleton. There’s a lot that may outrage fans of the original novel, but this is, nonetheless, a respectful, interesting, and worthwhile adaptation.